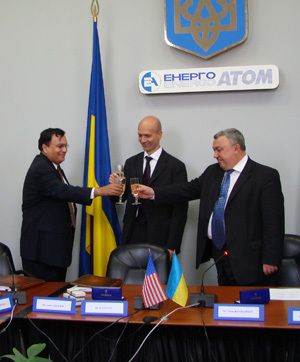 (Left to right in photo) Dr. Kris Singh, President of Holtec International, Mr. Anders Jackson, Vice President of Westinghouse, and Mr. Yuri Kovrizhkin, President of Energoatom, toast recent contract signings with two USA companies, Westinghouse for supply of nuclear fuel and with Holtec for supply of spent fuel transport systems. Fuel Business and the Holtec International contract by President/CEO Dr.
States, pay his first official visit to Ukraine, March 31st and April 1st. who serves as USUBC president. a strong democratic, private market driven nationhood," Williams stated. on this program for several years." "Holtec's International President/CEO Dr. Kris Singh, William Woodward. during autumn and winter maximum loads generated about 53 percent of the country's electricity. Zaporizha NPP is the largest nuclear generating facility in Europe. nuclear power generation for nearly 50 percent of its energy requirements. greatly increasing the country's overall energy security. throughout Central and Eastern Europe for nuclear fuel." International" signed an amendment to their 2005 contract for the certification, manufacturing, and testing of the Holtec International Dual Purpose Canister Spent Fuel Management System (HI-STORM 190) in Ukraine. Khmelnytsky, Rivne and South Ukraine Nuclear Power Plants. Ukrainian workers, and transfer sophisticated technology to the country. cycle on an expedited schedule. to enhance its energy security through the establishment of a domestic spent fuel storage infrastructure in Ukraine. The cost of commissioning such systems can be recovered in about two years of shipping fees that Ukraine currently pays to export its spent fuel. accelerate localization of the used fuel management technology know-how. spent fuel. This selection was conducted through a comprehensive, open and transparent international tender conducted by Energoatom and based on the overall merit of Holtec's commercial proposal and technology. assemblies from the Chornobyl reactors. this at an expanded session of the Cabinet of Ministers. alternative nuclear fuel to Ukraine," said the minister. shipment, according to the ministry's press secretary. VVER-1000 in 2010 (the first batch can include 120 - 144 fuel assemblies. it should be implemented as a commercial project. Westinghouse at the 3rd reactor of Southern Ukrainian NPP. in 2009 of 42 US-made assemblies more. be launched in 2010, according to Emergencies Minister, Volodymyr Shandra. building of the new storage facility at the Chornobyl NPP. on whether to use them will be made. of Ukraine confirms the possibility of using them safely.